Have you seen the unmatched beauty of cedar roofing? Homeowners get more than beauty when they choose cedar shingles or cedar shakes for their roof. Cedar also has the benefit of longevity, lasting up to forty years under good conditions. They are durable even in severe storms and wind, and the wood’s natural fibers can actually bounce back after a hail storm. Do you want exceptional energy efficiency? 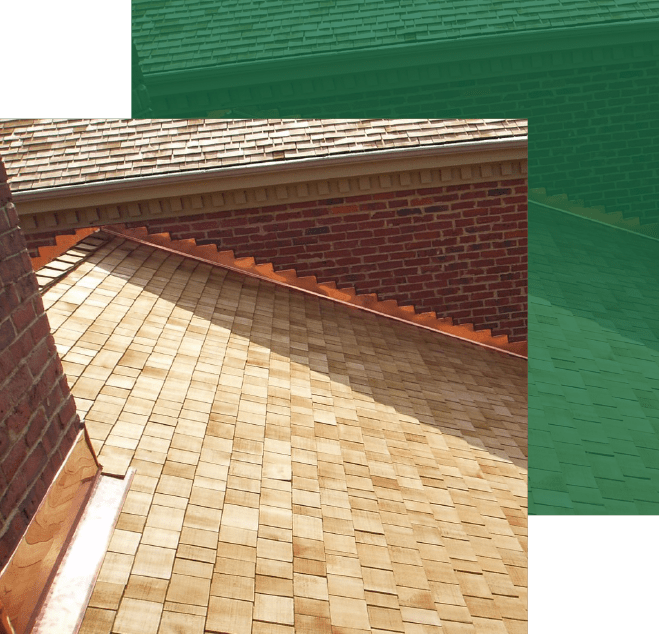 Cedar is a natural insulator, preventing the transfer of heat and cold better than any other roofing material. In addition, cedar shakes and shingles are recyclable and a renewable resource for less environmental impact. The terms cedar shingles and cedar shakes are often used interchangeably. Cedar shingles generally have a smoother, more tailored appearance. Each shingle is sawn on both sides for a precise, tightly layered fit, which is great weatherproofing to have in Wisconsin’s harsh winters. Cedar shakes have a more rustic appearance, a perfect look for a country cabin or cottage. They’ll be sawn smooth underneath but have a rough, textured side facing up. Since shakes don’t have as tight a fit, they require weatherproofing and insulating between layers. Compared to asphalt, cedar shingles are more expensive. They also cost more to install. However, they have a higher return on investment with quality and longevity if you’re willing to put in the maintenance. Cedar roofs require regular inspections and maintenance to prevent moss, mold, and mildew. There are treatments to preserve the wood and prevent fungal growth. If you find that your color is fading or looking gray, cedar can be stained. We’d be happy to give you a quote for roofing your Wisconsin home with cedar shingles. Only you can decide if the beauty, quality, lifespan, durability, and energy efficiency outweigh the cost and maintenance for you. Call or email Twin Pines to get started!